Connecticut experienced continued overall economic improvement in 2017, based on the index performances of cities and towns. The indexes give a broad measure of business and resident economic well-being of each town, allowing comparisons among them. 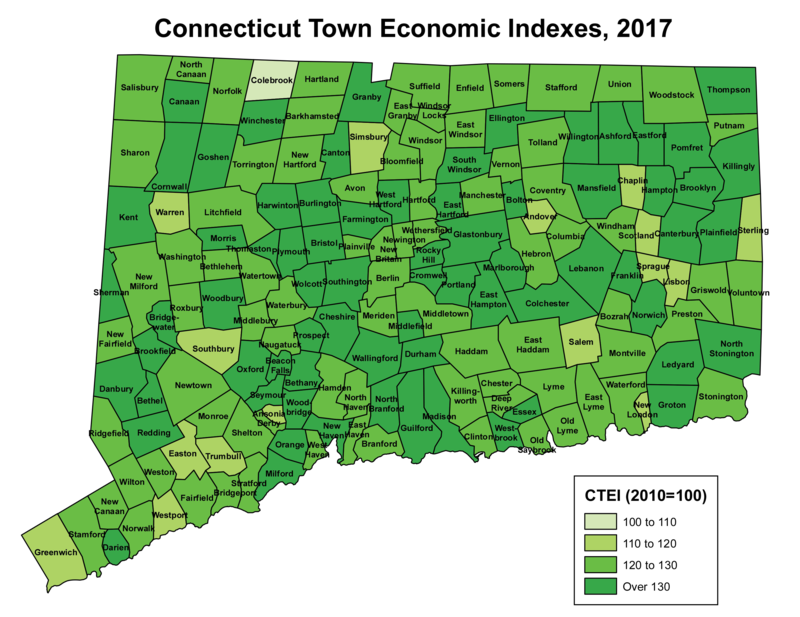 The Connecticut Town Economic Indexes (CTEI) were introduced three years ago and are released annually. The Connecticut Department of Labor’s Office of Research developed the composite indexes of all 169 municipalities in the state to measure each town or city’s overall economic health, which then can be ranked and compared to others to gain perspective. Four annual average town economic indicators were used as components, which are total covered business establishments, total covered employment, inflation-adjusted covered annual average wages, and the unemployment rate. Establishments are the physical work units located in the municipality. Employment is the number of employees on payroll in the establishments that are located in the town. Wages are the aggregate payroll pay divided by the total average employment. These three measures come from the Quarterly Census of Employment and Wages (QCEW) program and include all those who are covered under the unemployment insurance law, thus capturing nearly 100 percent of all the employees in each town. Establishments, employment and wages are proxy for each municipality’s business activities and its overall economic strength, while the unemployment rate measures the overall economic health of its residents. Each of the four components was given a 25 percent weight. 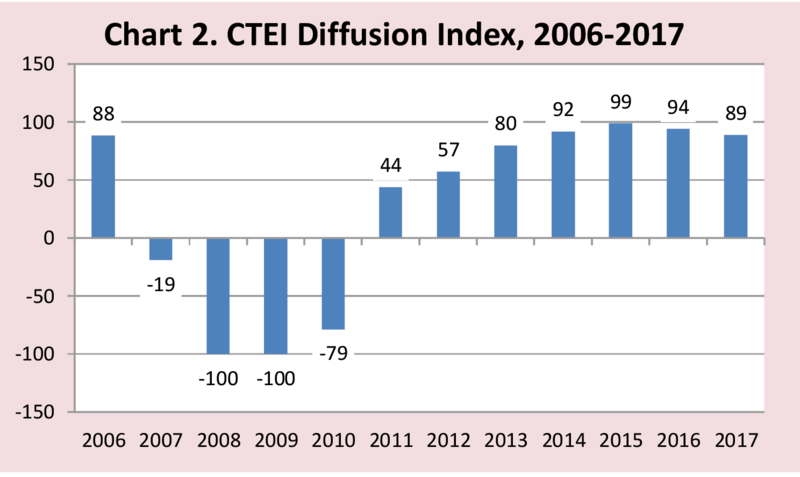 The CTEI’s base year is 2010, which equals 100. The wage component was adjusted to 2010 dollars and unemployment rate changes were inversed to reflect the right economic direction. By combining these four major economic indicators, the index allows comparisons among towns. Reflecting an ongoing economic recovery, 159 cities and/or towns saw business and labor market conditions improve, while nine worsened. One was unchanged over the year. Because the town sizes can vary greatly, a same change in one index value of a small town would not necessarily mean the same degree of economic growth as a large city. Therefore, the comparisons were grouped in three categories: towns with a population under 25,000, towns or cities with a population between 25,000 and 100,000, and cities with over 100,000. Among the towns with a population under 25,000, Franklin and Norfolk’s overall economy grew the fastest from 2016 to 2017. Mansfield and Norwich were the two fastest over the year among the towns or cities with a population between 25,000 and 100,000. Of the five largest cities with a population of 100,000 or more, Hartford and New Haven had the fastest overall economic recovery last year. When compared with 2010, when the employment recovery began in Connecticut, all 169 cities and towns’ indexes showed increases in 2017. Among the small towns with residents fewer than 25,000, North Stonington and Canaan experienced the fastest economic growth between 2010 and 2017. Glastonbury and Groton were the two fastest growing towns among those with a population between 25,000 and 100,000. Among the largest cities (population over 100,000), as (Chart 1) shows, New Haven and Stamford’s economy grew the most in the last seven years. The map also shows the different ranges of economic recovery rate of each municipality in the state. The index by Labor Market Area (LMA) is the average of all town indexes that make up that labor market area. The index in all nine regions in Connecticut grew from 2010 to 2017. The Danielson-Northeast LMA’s overall economy grew the fastest, followed by the New Haven and Waterbury areas. The Enfield and Bridgeport-Stamford LMA indexes, however, increased at a slower pace than the statewide index. The total number of business establishments in Connecticut rose by 2.0% to 119,669 from 2016 to 2017, a faster growth than the 0.9% from the year before. Stamford continued to dominate, with the largest number of businesses of the 169 cities and towns. Since 2010, Connecticut’s overall number of businesses increased 7.5%. Overall, 80% of the total municipalities added new establishments over the year, and 84% since 2010. Last year’s average statewide employment rose 0.2% from 2016 and 4.6% from 2010. Half of the cities and towns in the state experienced job recovery over the year, lower than 58% from 2015 to 2016. Overall, 72% of the municipalities in the state have added jobs since the employment recovery began in 2010. In 2017, 75% of all cities and towns in the state posted inflation-adjusted wage gains over the year, up from 70% in 2016. The statewide real annual average wage was $58,376 per worker, a 1.5% decline over 2016 and a 1.8% decrease from 2010. The highest real average pays were in businesses located in Greenwich at $120,642 last year. Hartford continued to post the highest unemployment rate (8.1%) last year, a drop from 9.2% in 2016. Overall, the statewide rate fell from 5.1% in 2016 to 4.7% in 2017. For a detailed analysis and the complete table of unemployment rates for all 169 municipalities, see “2017 Unemployment Rate by Town” in the June 2018 issue of the Connecticut Economic Digest. One way to measure aggregate performance of the CTEI of 169 cities and towns in Connecticut is to use a diffusion index. 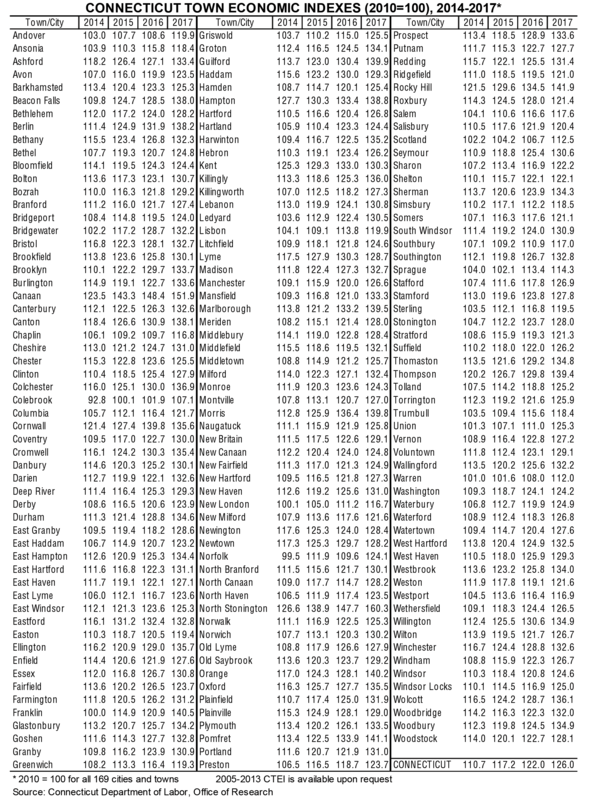 For each town, the index figure is up, down, or unchanged over the year. The diffusion index is calculated by subtracting the share of towns that experienced decrease in their indexes from the share that had increases over the year. As expected, during the 2008-2010 period, the index values were -100, -100, and -79, respectively, when Connecticut was in an employment downturn. The state economy gradually recovered from 2011, as the diffusion index numbers indicate on (Chart 2), and by 2015 nearly all towns were gaining. 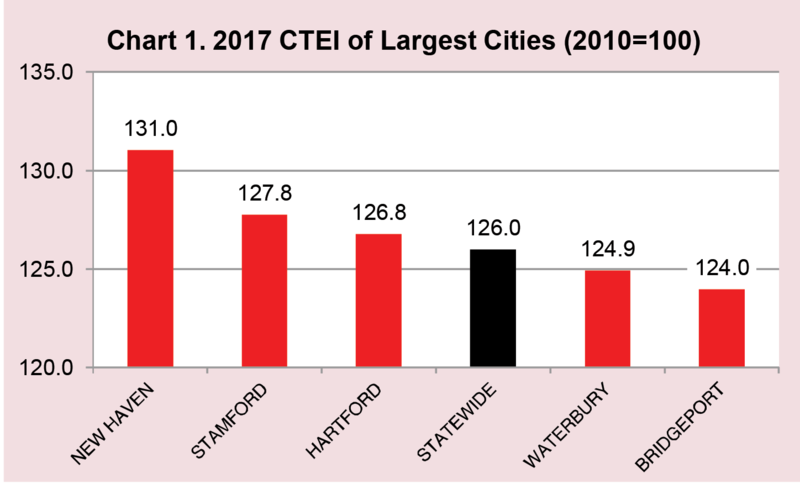 The CTEI show that almost all cities and towns in Connecticut have been recovering steadily since 2011, with some municipalities, such as New Haven, showing particular strength.